The Cuban Government offers solidarity regarding any new challenges faced by Maduro’s Government in the new six-year presidential term. 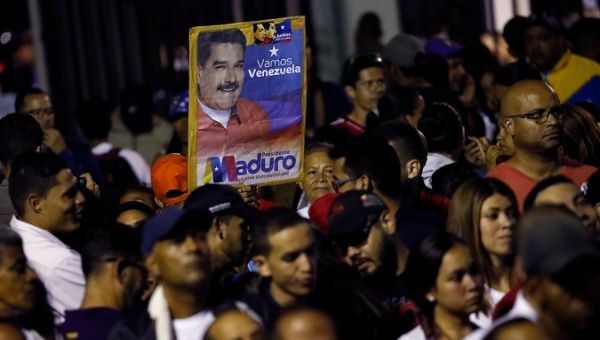 May 20 (teleSUR) Cuban officials, late Sunday, congratulated Venezuelan President Nicolas Maduro on an overwhelming victory in the presidential election, in letters posted on Venezuela’s Foreign Affairs Minister Jorge Arreaza‘s Twitter page. “The Bolivarian and Chavista community has demonstrated once again it’s determination in defending the legacy of Chavez, who you represent worthily,” President Miguel Diaz-Canel Bermudez said in a letter addressed to Maduro. Diaz-Canel added that the Cuban Government will be supportive and offer solidarity regarding any new challenges faced by Maduro’s Government in the new six-year presidential term. Former President and Cuban Communist Party chief Raul Castro Ruz also congratulated Maduro on victory in the Venezuelan presidential elections. Miguel Diaz-Canel, Presidente de los Consejos de Estado y de Ministros de Cuba, felicita al Presidente @NicolasMaduro por su contundente victoria y expresa la solidaridad de la Revolución Cubana para los nuevos desafíos por venir. Raúl Castro Ruz, Primer Secretario del Comité Central del Partido Comunista de Cuba y líder histórico de la Revolución Cubana, felicita al Presidente @NicolasMaduro por su trascendente victoria electoral. “With revolutionary pride, I send you, in the name of the Cuban Communist Party as well as my own, the warmest congratulations for your transcendental electoral victory,” Castro wrote to the Venezuelan president. Diaz-Canel, who was recently installed as head of state for the Caribbean island, is the first leader of the island nation in a post-Castro era.